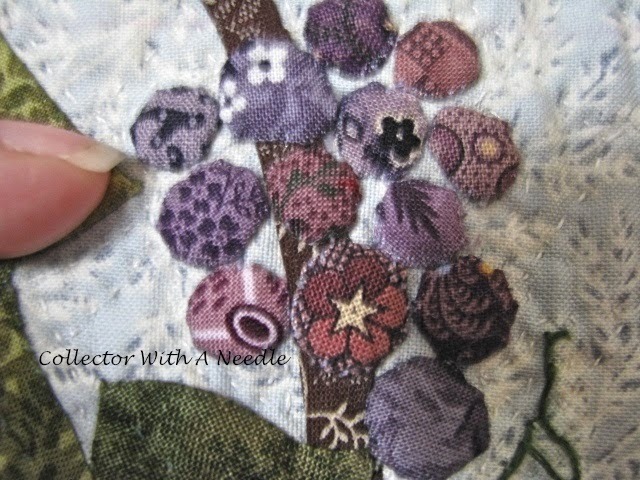 My previous post on appliqued grapes was motivated by a block in set seven. I stopped counting after the first 12 grapes, but let's just say the quantity of grapes in this block tops the speed limit of most US highways! Does that sound better than 65? 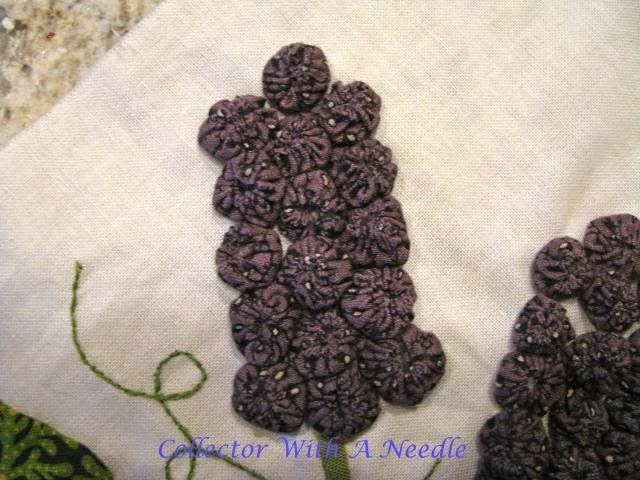 I love the shape of the stems, the curve of the embroidered tendrils and of course...the grape clusters! I did the embroidery first, then the stems. Next came the leaves, while contemplating which technique to use for the grapes. I decided not to restitch the block. I like the texture of these clusters. The technique makes for great discussion. I also like the idea of using multiple techniques in the quilt. We still have not determined if Matilda made all of the blocks or if it was a presentation quilt. Each grape was made from a circle of purple fabric. I turned under the circle edge and ran a gathering stitch around the edge. 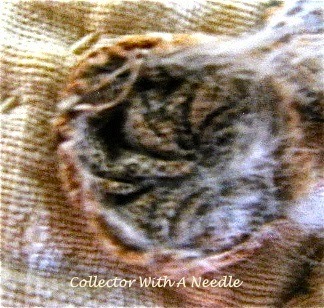 After stuffing the circle with bits of cotton batting I pulled the gathering thread closed, and knotted the thread. Without cutting the thread I ran it through the center of the circle and into the block backing fabric. I made another knot, tacking the grape to the background fabric. 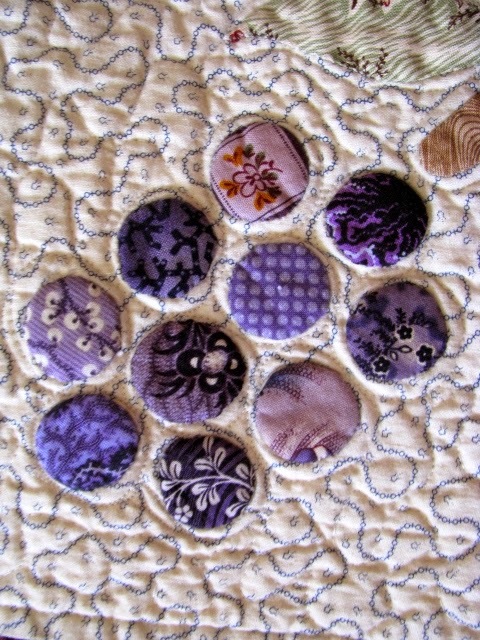 Then I stitched the bottom circle of the grape to the backing fabric from the back side. Being a back baster, the circle was already drawn. The rest of the blocks in set seven include oak leaves, a red flower stem and great yellow flower! 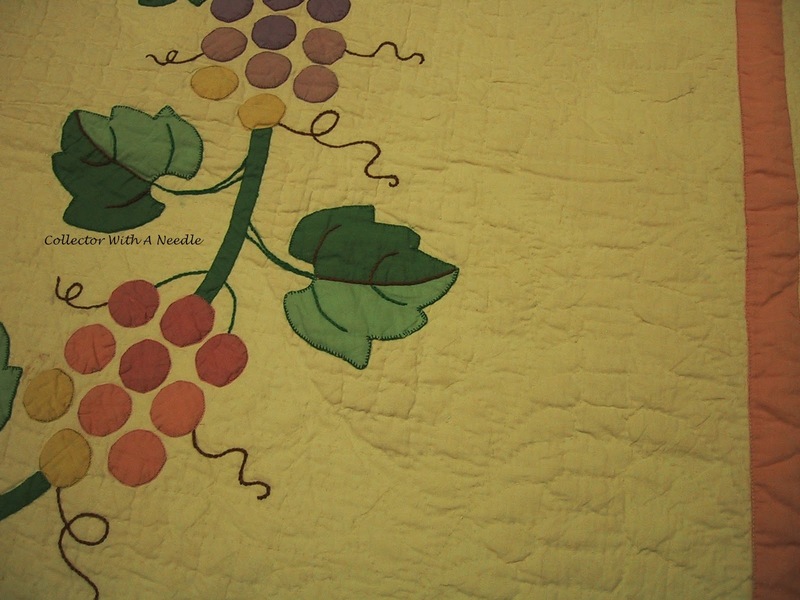 The Noah and Matilda quilt has a lot of appliqued grapes. I think you should applique in whatever technique you enjoy. 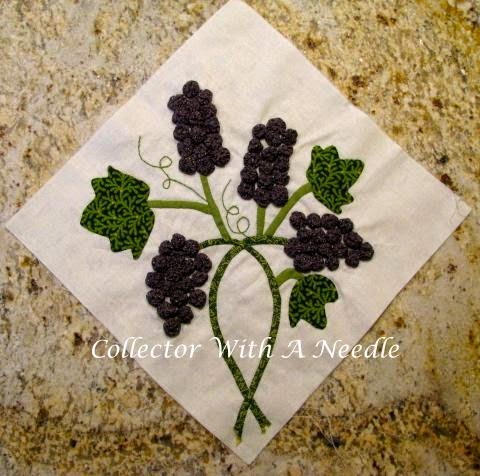 Today I'm sharing a variety of applique grapes. The green grape block is in set four of the blocks. I chose to back baste the circles and stuff the grapes as I needle turned each circle. I think they match the originals pretty well. I did use a print for the leaves as opposed to the solid in the original. I like to take classes and try new applique techniques. This is from one of my first applique classes. In this class we used a drafting ruler of circles to trace the circles. Now I back baste - even tiny circles. We also cut circles from cotton batting scraps and covered them with the fabric circles, then applied the circle to the backing fabric. These are rather large grapes, about 1.25" each. I like using a variety of prints in the grapes. As I recall, the rest of the class used batiks. This is the block in the completed quilt. All hand applique, machine quilted. I completed it many years ago. I think the class was monthly with lessons in each of the 9 blocks. The other three months were sashing, borders and finishing. I remember the class was very rewarding and I think the patterns were drawn by the instructor. It was a pivotal year in my applique journey. This grape cluster was done with a similar technique. I cut the circles, about 1/2". 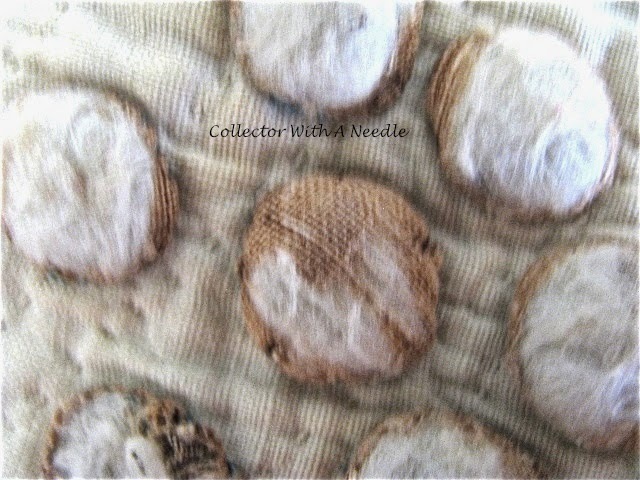 I used cotton batting circles cut from scraps. The finished grapes are about 1/4" - that's my pinkie finger in the photo. Again, I enjoyed using a variety of purple prints. I'm taking a little liberty calling these red circles grapes. They could be cherries or berries. This maker used contrasting thread and made the stitching part of the design. 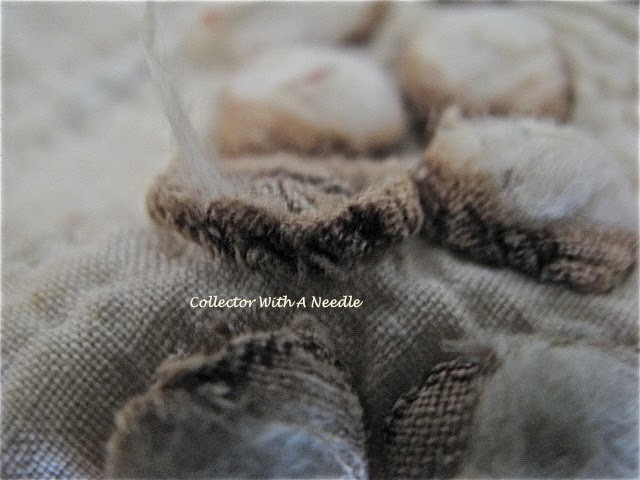 The buttonhole stitch is rather deep and acts as an embellishment. The circles are not stuffed. 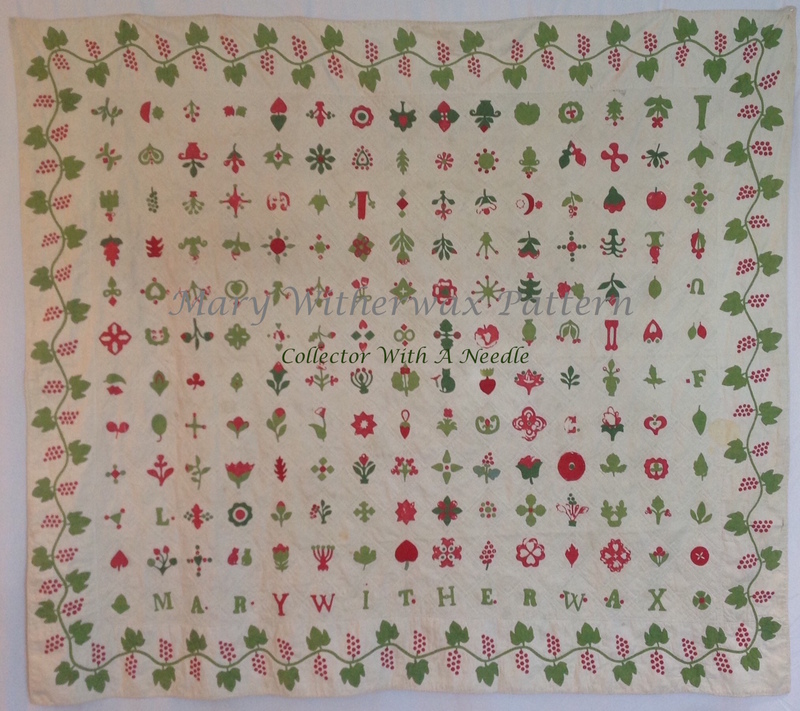 This quilt (circa 1845) is in the collection of the Brooklyn Art Museum and is currently traveling in the Workt exhibit. Again, I'm taking a little liberty calling these circles grapes. I think we can agree they are appliqued circles. 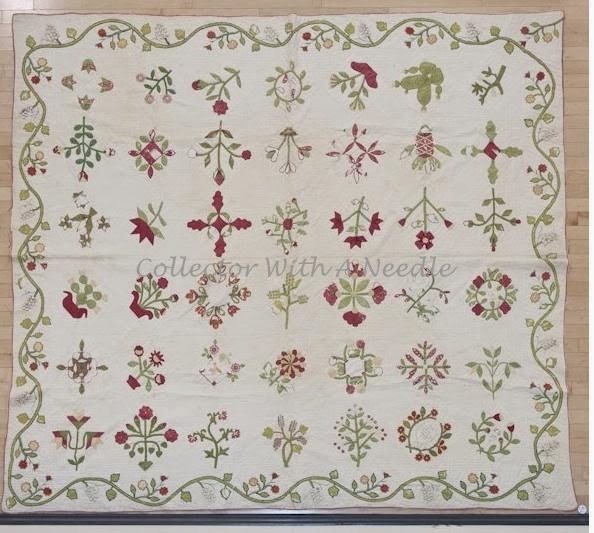 This quilt is circa 1830. Buttonhole stitching surrounds each circle. The circles finish at about 1/2". The fabric circles were cut from a larger floral print. Precision was important to this maker. My personal preference is a little variation in the circles in color, size and shape. I think the variation gives a more organic look. These grapes are on a kit quilt, circa 1950. The fabrics are all solid. The clusters of grapes range from purple and pink to yellow and cream. Each circle is lightly padded. In some areas the faint black line shadow from the stamped kit adds a depth to the circles. 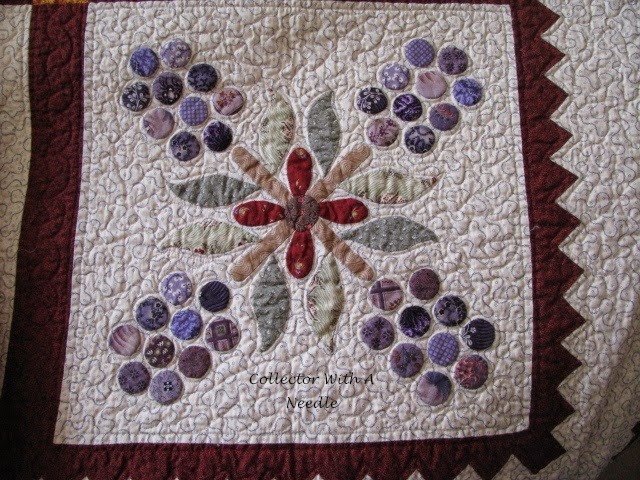 The grapes in the Charlotte Jane Whitehill quilt, "Indiana Wreath" are oval shaped and heavily stuffed. Each grape is at least a full inch long. She used solid fabrics, gradating the color placement from light to dark. 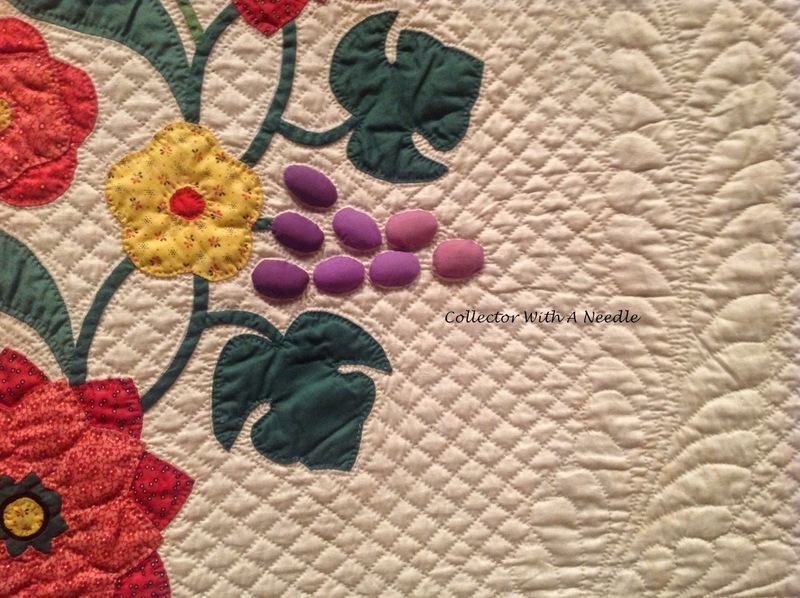 Stuffed grapes are abundant in antique applique quilts. In this example the purple printed fabric was gathered, stuffed and tacked down. Look closely at the background fabric to see a small pucker where the grape is attached. This technique leaves the grape more dimensional. I like the slight size variation in these grapes. So why all this interest in applique grapes and circles? I made a discovery this morning on the Noah and Matilda quilt! After examining the purple grapes on Noah and Matilda's quilt I thought they looked like a technique new to me. How exciting! Don't these look similar to an embroidered eyelet or fabric covered button? 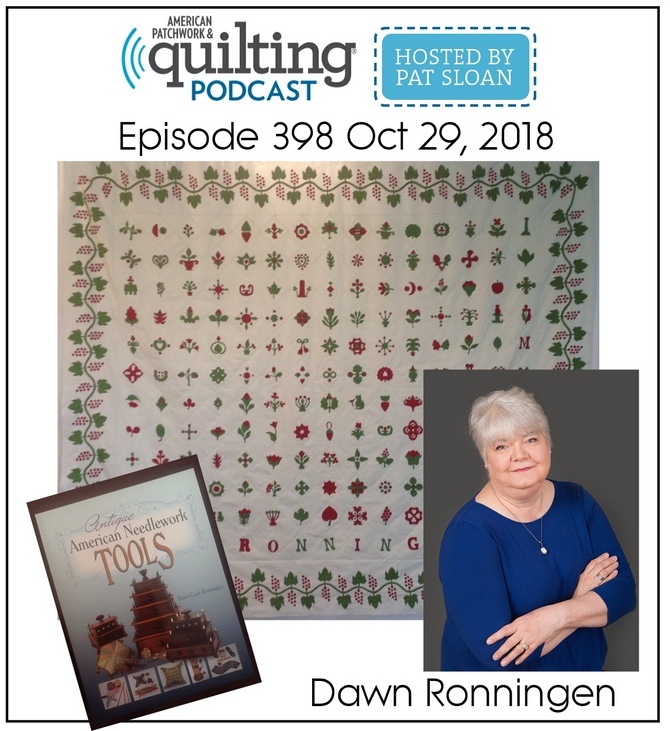 I consulted a few quilt historians, fellow quilt study enthusiasts and applique artists. Following good advice, I set about recreating the grapes. I gathered circles, stuffed them then tried to flatten them out and stitch around the outer edge to achieve the uniform swirl on the originals. To say my results were dismal is an understatement. It wasn't that I didn't like my little grapes, I do. I was disappointed because they didn't look like the originals. They sit high off the backing fabric and being stuffed, do not flatten out. Time to look at the original again. I took the liberty to excavate a little more aggressively than I had in the past. Where the purple fabric had failed I looked under the popped cotton tuft. Had the cotton fiber come from between the gathers as previously thought? How do the grape sides look? The tufts of cotton filling stayed so nice and rounded after the purple fabric failed. Even if I wanted to, I don't think I could pull them off. 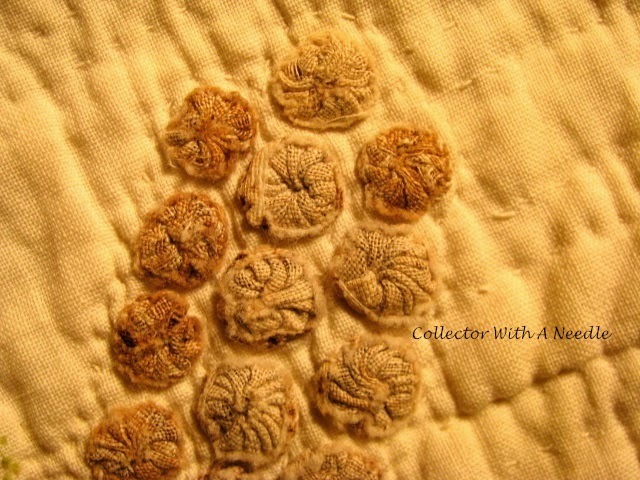 The quilt came to me in this condition, so at some point(s) in its life it had some rough treatment. I am so happy we have been able to document and preserve the story of this quilt. (Research is still ongoing). Or, maybe it was when I saw this particular grape. All of the gathers are the bottom of the grape, under the filling. I was disappointed and excited at the same time. Disappointed it was not a 'new to me' technique. Excited to solve the mystery. Stay tuned - did I restitch my purple grape block? What's your favorite grape applique technique? Thank you for taking time to visit our blog. 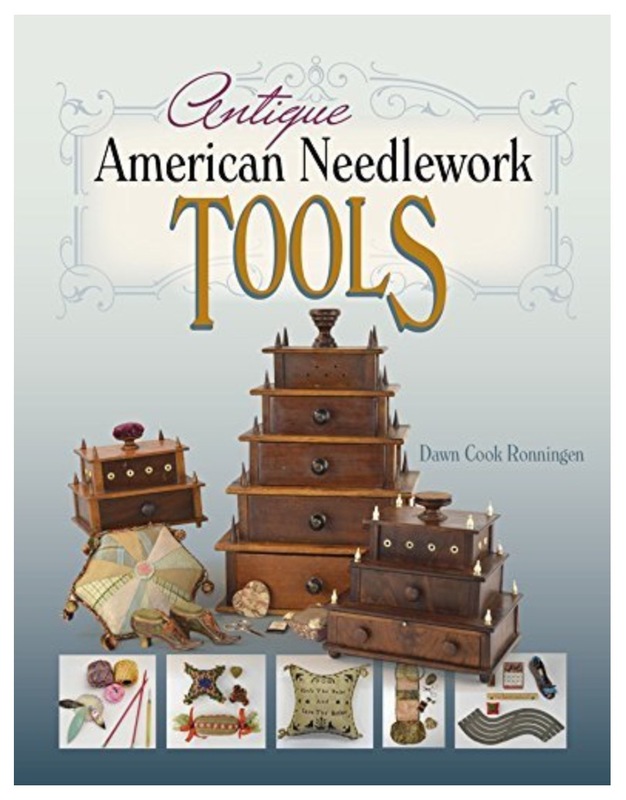 We are sharing some of our quilt collection, patterns and assorted of vintage needlework tools. Quilt Patterns are available in our Etsy Store. Please ask permission to use or PIN our photos. Join us recreating the Noah and Matilda Album Quilt from our collection. Each pattern file includes multiple blocks in a .pdf file with a link emailed directly to you. The 8" blocks and border are completed in 12 monthly pattern files. Click on the Noah and Matilda Tab on this blog to order. .pdf patterns released monthly in 2015. Click the photo to see the order page. Quilt Top shown is a partial. (c) Ronningen. Simple theme. Powered by Blogger.